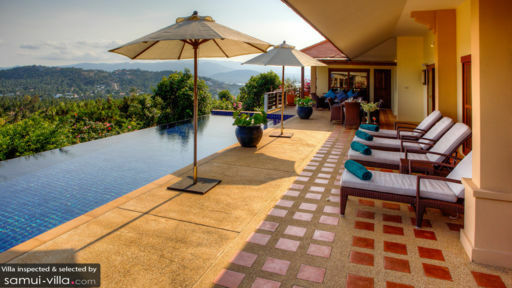 Perched upon a hilltop in Choeng Mon, Alpha Villa provides stunning vistas of its surrounding tropical greenery. This modern vacation home sits in the midst of a well-manicured garden, offering a peaceful retreat for vacation makers seeking a relaxing holiday in the tropics. Five commodious bedrooms offer ample space for accommodating ten guests. The luxurious double master bedroom opens out to the pool terrace, and overlooks the scenic environs surrounding the villa. Bath times in this room will prove to be a pleasure, for couples can opt to enjoy a pampering soak in the captivating outdoor tub. The double and twin guest room share a bathroom, serving as an ideal accommodation for small families. Guests are sure to contend for a stay in the second master suite, for it features a spacious bathroom containing a beautiful skylight. A variety of tasteful touches, such as eye-catching wall paintings, pretty lamps and colourful cushions add on to the charm of the bedrooms. Start the day by taking an invigorating dip in the infinity pool. After your swim, satiate your hunger with a satisfying breakfast, laid out upon the alfresco dining table at the sun deck. A handful of pillowy sunbeds lining the pool deck are perfect for leisurely sun seekers, while the soft, grassy grounds of the lawn are ideal for picnickers. As the sun sets, relax by the poolside, and set your gaze on the beautiful hues filling up the boundless sky. Alpha Villa contains a series of airy living spaces that open out to the picturesque garden. The interiors are made cosy by the use of warm hues, wooden fixtures, plush couches and amber lighting. Floor-to-ceiling sliding doors flank the walls of the main living spaces, inviting plenty of sunlight and sea breeze to flow in. 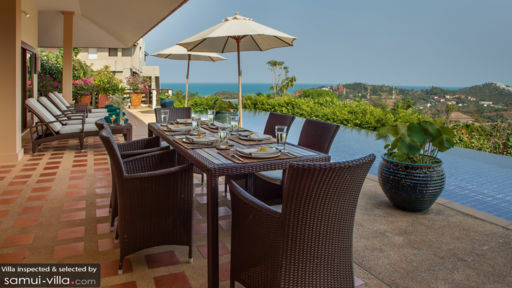 Savour your meals in the homely dining area, or feast on a spread outdoors by the poolside. 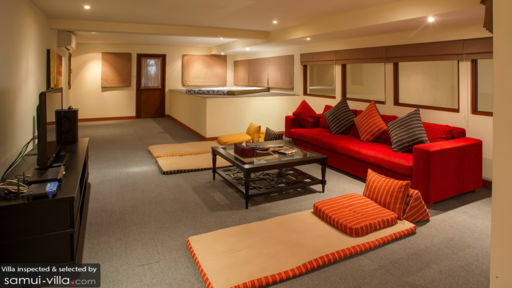 A well-equipped AV room completes a fun-filled night spent indoors catching up on your favourite films. Villa Alpha is a full service property with two on-site staff. Housekeeping services, personal guest services, security services, airport transfers and a daily breakfast service are included with your stay. A baby cot is available for use free of charge. Amenities available at additional cost include personal chef services, personal driver services, boat rental, car rental, laundry service and in-villa massages. Alpha Villa sits at a prime spot, providing guests with quick access to the beach and the main commercial centre of Samui. Venture out to the golden coasts for an afternoon of fun under the sun, tuck into delectable seafood dishes at one of the beachfront restaurants, and explore the shops of Samui during a lively and buzzing night.